Here we see some owner's attempt to deal with a common problem with Harmony Bobkats and Silhouettes with vibratos. First of all the bridge is the same wood floating bridge that was / is common on allot of guitars, with string slots cut into it's straight saddle, ....certainly not intended for use with a vibrato. A vibrato makes the bridge slide fore and aft on the pickguard. Agravating the matter was the strings sticking in the string slots. Harmony's attempt to facilitate using this bridge was to glue it down on the pickguard, but they did so perpindicular to the trings and in a position quite far away from an intonated position; WAY out of intonation, ...which was not uncommon at all until intonation became widely known about in the late 1960's and early 1970's. If the mild glue didn't break away on it's own, as was common, then Guitarists would break it away to better intone the bridge by moving it rearward and slanting it forward on the treble end. 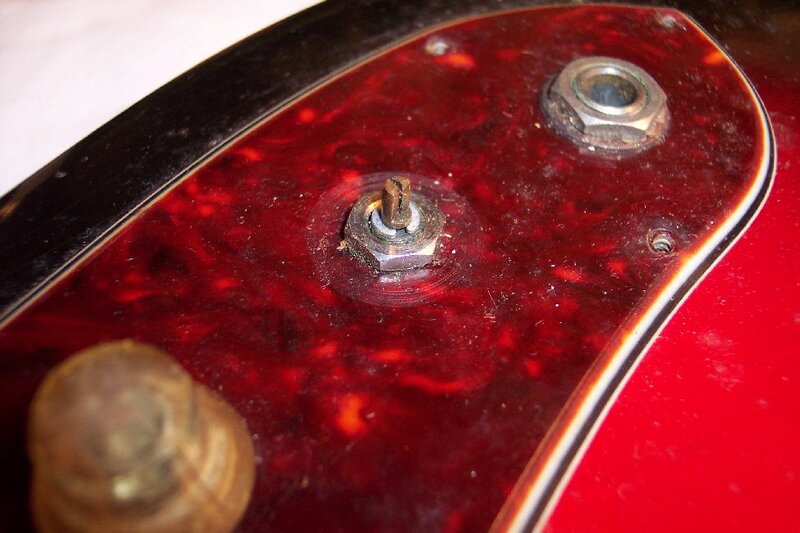 Here we can see that someone scratched up the pickguard in an attempt to provide some friction to reduce the bridge plate from sliding with vibrato use. Further below we will see what they did to the bridge plate for the same purpose. Here we see the bridge plate with the height adjustment wheels on. 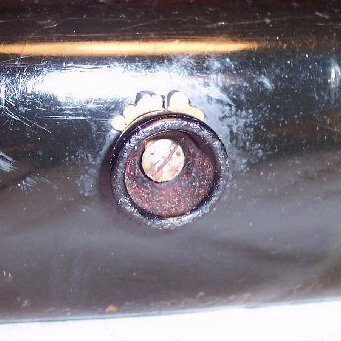 Notice that the corrosion on the stud threads is only where hand salt sweat touched the studs. A bit of penetrating oil soaking and wire brush clean up and they will look and be just fine. Again, allot of fun to see 'before' and 'after' pictures when the work is finished. Well, let's suppose the person who shaved this bridge plate and roughed it up for friction, ....had good intentions but wasn't much of a craftsman. Some credit is due for at least trying to work on his / her guitar, but it is better to know your limitations and get help on items a person doesn't know very well. This is one of those things that look easy in concept but doesn't turn out quite as well as probably intended. 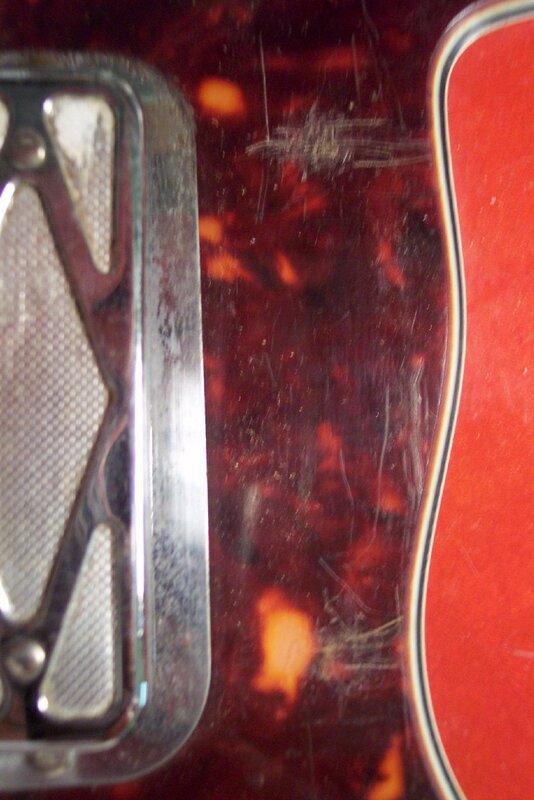 I will identically remake this piece out of 1960's rosewood stock I have that came from the original Danelectro factory's disposal sale when they shut down business in 1969. I was mistaken when previously stating that the bridge pickup tone pot shaft ear was broken. It is not. One flat side is machined down to hold the knobs securely for rotating. Only the knob is missing,which I have put out searches for within my guitar tech network. 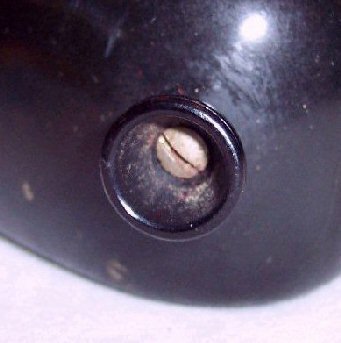 The white deposits almost always found in the underside cavities of old knobs is residue from molds that dealy love hand sweat moistened plastic. It will clean right off with some diluted Simple Green scrubbed with a small stiff artist brush. This guitar was played almost entirely in open chords positions, as can be seen by string marks on the surface of the first 4 frets. I will dress those frets and ensure they're in height conformity with higher frets. The strap buttons are black plastic and original and will clean up nicely. Here's another example of owners that don't pay much attention to details in keeping their guitar cleaned up reasonably well. But after a well used guitar ages and picks up scars and marks and still wails, it's rather common that a number of Players forget the TLC their guitars are due.